Downtown St. Louis is a great place to begin a Lewis & Clark road trip. When we visited, we even stayed at a hotel with a Lewis & Clark theme. Even if you don’t stay at the Drury Plaza, be sure to go in to the lobby and see their impressive sculpture of Lewis & Clark, Sacagawea, York, and Seaman! As everyone knows, the defining feature of downtown St. Louis is the towering Gateway Arch, which dominates St. Louis with simple majesty. Its shimmering beauty and grandeur are transporting from any angle, and almost surreal when viewed suddenly when approaching the city. 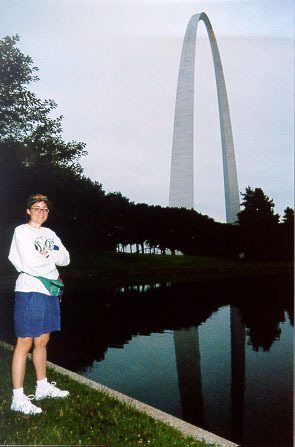 I remember the first time I ever visited St. Louis, having to try not to look at the Arch when I was driving in from the airport, so I wouldn’t become distracted by it and run up a telephone pole. Photographs do not do justice to its size nor its overwhelming presence. What you might not know is the story of how the Arch came to be built. The area covered by the Arch and its surrounding park, called the Jefferson National Expansion Memorial, was once the entire village of St. Louis as Meriwether Lewis and William Clark knew it. Unfortunately, no trace of the old city remains (though we did stand and admire the view of the Mississippi from the approximate location of William Clark’s house). Over the course of the 19th century, much of old French-American St. Louis was destroyed bit by bit, replaced with warehouses, ironworks, sailmakers, saloons, and other businesses to serve the bustling river port that the city became . But by the turn of the 20th century, railroads had stolen most of the business from the riverboats. Chicago, not St. Louis, became the region’s leading city, and the levee area slowly decayed into a blighted and dangerous husk. Many of the buildings were abandoned; others became low dives. The St. Louis riverfront in 1911. Courtesy Scott K. Williams. In 1933, St. Louis attorney Luther Ely Smith became inspired during a trip to Vincennes, Indiana to visit the then-new memorial to George Rogers Clark (also a critical figure in the history of early St. Louis). He spearheaded a drive by civic leaders to lobby the federal government to make the restoration of the St. Louis riverfront into a New Deal project that would create hundreds of jobs and bring pride back to one of America’s great cities. Two years later, President Franklin D. Roosevelt designated the entire area as a national park and authorized a national architecture competition to build the Jefferson National Expansion Memorial. The Old Rock House (left) in 1940. The 1818 warehouse of famous fur trader Manuel Lisa had become a saloon that attracted famous bluesmen like W.C. Handy. Memorably, an evening of nickel whiskey and pig knuckles downstairs could be followed by an upstairs pad for 15 cents. Using the power of eminent domain and a bond issue, the city razed 40 city blocks to get ready for the project. The only buildings spared in the designated area were the Old Cathedral, the Old Courthouse (saved after an epic fight by preservationists), and Manuel Lisa’s historic fur-trading warehouse, known as the Old Rock House. Tragically, the Old Rock House would eventually be demolished to settle a Kafka-esqe, decades-long dispute with a railroad company that owned the elevated tracks along the levee. In retrospect, St. Louis suffered a major loss of irreplacable historic heritage in this wholesale demolition (William Clark’s warehouse was another one of the buildings destroyed; Clark’s house and Indian museum had been torn down back in 1851). The project had to be mothballed because of World War II, but the competition, when it was finally held in 1947, drew 176 entries from leading architects and city planners from around the world. The winner was the Finnish-American designer Eero Saarinen. (In addition to the Gateway Arch, Saarinen’s famous works include the iconic designs for the terminals at JFK and Dulles Airports). Saarinen’s sophisticated stainless-steel design would be the tallest monument in the country, and defined the Jefferson National Expansion Memorial as a sweeping symbol of diversity, openness, and unbounded freedom. Eero Saarinen's 1947 design. Courtesy Washington University in St. Louis. Many elements of Saarinen’s original design were never built, especially the heavily wooded grounds and additional buildings, restaurants, and shops. Further work was delayed about 10 more years by the Korean War and the railroad company dispute. 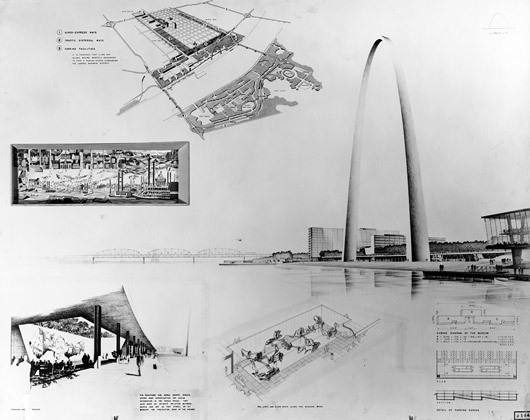 After an agreement was finally worked out in 1957, Saarinen and landscape architect Dan Kiley began work on the final plans, which brought about several of the features visitors love about the Arch today, namely its symmetry with the historic Old Courthouse and the underground Museum of Westward Expansion. Beautiful curved walkways and gently rolling hills were added in to cleverly disguise the railroad’s tunnel and several major roads and highways. During the construction, a major urban renovation of the rest of downtown St. Louis also took place, including construction of the interstate highway through town and the LaClede’s Landing entertainment district. 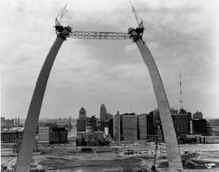 After years of painstaking construction, the Arch was “topped” on October 28, 1965, and formally dedicated in May 1968. Construction of the museum and the landscaping of the park continued through the 1970s. And it ain’t over yet. There is still much work to be done to integrate the Arch and park with the city, the river, and the Illinois side of the river. In fact, the view of Illinois is one of the only disappointing aspects of the park, as you gaze across the river at a few scruffy buildings and a big casino touting “Saturday Night Dance Party.” I was excited to learn that a design competition is underway right now and the winner will be named in October. For more information on “Framing a Modern Masterpiece: The City + The Arch + The River 2015,” see www.cityarchrivercompetition.org. There is a tram inside the Arch that you can take to the top. I’m not the kind of person who gets much of a thrill from going up to the top of things — especially not if you have to spend precious vacation time waiting in line to do it — so we skipped that and spent several hours in the underground Museum of Westward Expansion. This is an excellent museum with a large variety of exhibits on American settlement of the west. As far as Lewis & Clark go, there are some great exhibits of scientific instruments, weapons, and cooking utensils; amazing panoramic photos of sites from the Expedition; and a cool collection of Indian peace medals. There’s even an animatronic version of Clark that talks to you in a lifelike-yet-not manner that brought to mind Yul Brynner’s memorable turn as the creepy cowboy robot in Westworld. There’s a great gift shop and book store here too. 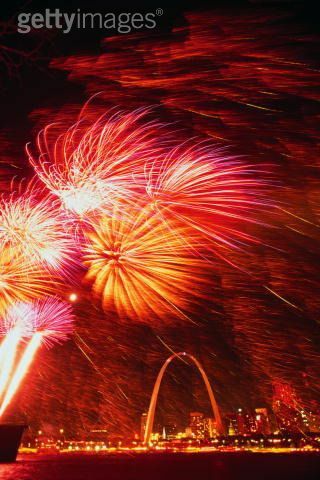 Best of all, when we visited the Arch, St. Louis was having a summer festival. It was very special to go back at night, sit under the Arch, listen to music, and watch beautiful fireworks reflect off the Mississippi and the Arch. This is a wonderful symbol of the spirit and survival of St. Louis. I remember visiting the Gateway Arch a few years ago, and was really impressed with its size and engineering! I didn’t know though how long it took to actually be built and that there are still plans in the works to integrate it into the city. That’d be really great to go back and see it when that’s done. When we visited, my family and I went to the top. I wouldn’t recommend it to those with a fear of heights or get claustrophobic because the tram compartments are really small. But the views from there are so beautiful!